DEAR MAYO CLINIC: My mother has cancer that’s spread to her bones. She’s in significant pain but afraid to take an opioid medication, because she doesn’t want to get addicted. It’s awful to see her in pain all the time. Can she safely take an opioid to get some relief? What are the risks of addiction for someone like her? ANSWER: This is a common concern. But opioid use for people who have serious, ongoing cancer pain often can be managed in a way that will ease pain with a low risk of addiction. Also, if your mother is determined not to take an opioid, alternatives exist that can relieve pain. Pain can have serious health side effects of its own, so it’s important to find ways to manage it effectively. Opioids are powerful painkillers. Commonly prescribed opioid medications include oxycodone, morphine, hydromorphone, oxymorphone, hydrocodone, fentanyl, meperidine, codeine and methadone. 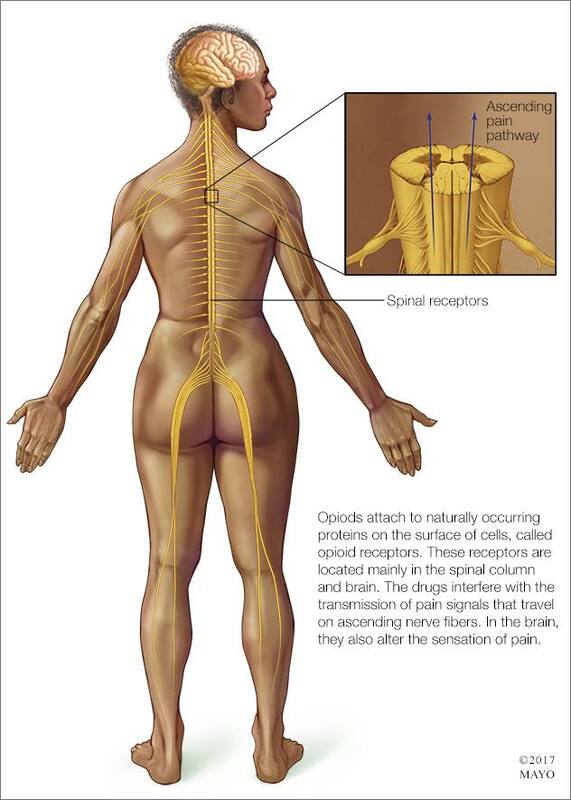 Opioids can treat severe ongoing pain effectively, such as pain caused by cancer. But they pose significant risks, including addiction and overdose, and must be managed and monitored carefully. When considering whether to take an opioid and the risk of addiction, it’s important to understand the difference between addiction and physical dependence. Many people believe the two are the same. They aren’t. If you take an opioid regularly, over the course of time, your body will become dependent on it. That means if you suddenly stop taking the drug, you’ll have withdrawal symptoms, such as sweating, muscle aches, fever, a fast heartbeat and feelings of anxiety. That doesn’t mean you are addicted to the drug, however. Addiction goes beyond physical dependence to having an irresistible craving for a drug, compulsive use of the drug, and continued use of the drug despite repeated, harmful consequences. In many cases, people with cancer pain can use opioids to ease severe pain. Then, when it’s no longer needed, the drug can be tapered off gradually over several weeks to decrease physical dependence and avoid withdrawal symptoms. Although you may frequently hear about the risks of opioid medication — and those risks are real — for people in your mother’s situation, these medications can have benefits. When pain becomes so severe that it limits physical and social activities, that can have serious, negative consequences on a person’s health overall. At that point, pain may become a greater health risk than the potential for addiction. But that’s not to say people with severe cancer pain cannot become addicted to opioids. The risk is still there, albeit smaller than in other situations where opioids may be used, such as for pain control after surgery. It’s crucial for opioid use to be monitored closely. In cases of cancer pain, medical oncologists typically oversee the medications as part of a comprehensive care plan. If, after weighing the risks and benefits, your mother still prefers not to take an opioid, there are other pain management options available. For example, medications such as tramadol and tapentadol work within the body in a way that’s similar to opioids, but they are lower potency. Because of that, they have a lower risk of addiction. Pain medications that don’t contain opioids, such as acetaminophen, nonsteroidal anti-inflammatory drugs like aspirin and ibuprofen, and naproxen sodium can help, too, as can anti-convulsants. These drugs also may be mixed with opioids to provide pain relief with lower doses of opioid medication. Those combinations should only be administered under careful supervision of a health care provider.